Nichan Craft Room » Blog Archive » How Many Times Do You Practice Before Making Real Project? There were kind of collars that i had to choose and some were fail. 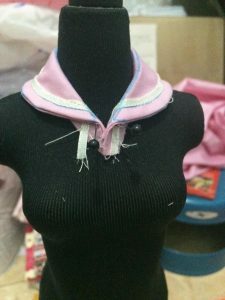 For each collar pattern, i practiced 2-3 times to sew the ribbon, then do fitting to see how the collar look on torso; if the look looked awkward, i put it on doll body. I wasn’t satisfied at all after some trials and decided to use another pattern, the one i was quite ‘pessimistic’ of how it would look. Apparently, it looked the best among other pattern I use. Yet, i was still not satisfied, so I modified the pattern a little bit. Each time, as i mentioned before, I practiced minimum 2 times to sew the ribbon on the collar. Sewing the ribbon with that curve is not easy. There is techniques to try and of course need a concentration more than before to do it. Quality of ribbon affects, too. So, yess, I also tried some ‘different’ ribbons. I practiced more than 15 times, trying about 5 patterns. Before making real project, i will make a prototype first using cheaper fabric. Last time, i was so sure to make on expensive fabric, the result wasn’t as expected. In a glance, it looks good but i’m not sure to represent it as ‘sell-able’ clothes (though I won’t sell my real project either…haha). So, again, how many times did you practice before making a real project? I’m not a professional seamstress, yet. Only selling a few. Yet, my soul is professional. My best friends who sew, too, AND not selling their handmade also have that professional soul. Even for ourselves, we want to do it correctly, well, properly, and decently.